Obesity is a disease. It has been since June 2013, at least according to the American Medical Association (AMA). The AMA formally recognized obesity as a disease with the intention that such a classification would prompt additional funding for obesity research. However, a set of studies published in Psychological Science1 earlier this year suggests that designating obesity as a disease without considering the psychological consequences has a variety of positive and negative implications for obese and average-weight individuals. Across a set of three studies where more than 50% of the 700+ participants were classified as overweight or obese according to the Body Mass Index (BMI), psychology researchers Crystal Hoyt, Jeni Burnette, and Lisa Auster-Gussman found that obese individuals reported significant decreases in weight concern and body dissatisfaction when they received the message that obesity was a disease, whereas average weight individuals demonstrated no such pattern when exposed to the same message. At first glance, this finding suggests that the “obesity as a disease” model is effective at increasing body satisfaction and, perhaps, decreasing internalized stigma. At a recent talk I attended, Dr. Burnette discussed these findings as well as related findings from some more recent studies about the relationship between the obesity as disease message and an entity mindset. An entity mindset is the belief that an ability or characteristic, such as intelligence or weight, is fixed and not malleable as a result of effort or behavior change2,3. Burnette suggested that believing obesity is a disease implies that weight is static, that it’s not people’s lack of willpower or behavior making them obese, but rather, their genes and physiologies. This notion seems to decrease anti-fat prejudice and blame placed on obese individuals4. This approach seems promising: reducing stigma and blame, as well as increasing the likelihood of research funding. There’s a catch, of course. In addition to the decreased weight concern and body dissatisfaction, obese individuals who saw the disease message were also more likely to make hypothetical unhealthy food choices, unlike average weight individuals or obese individuals exposed to the weight-management control. The researchers suggest that these food choices may be a downstream consequence of the disease label and the entity mindset it may induce. That is, if obesity indicates a physiological malfunction, thus making weight control efforts ineffective, why bother trying? The very message that decreases blame seems to reduce motivation to manage weight, too. The belief that weight loss efforts are ineffective for obese individuals is not completely implausible. Food researcher Traci Mann and fellow obesity researchers have found that long-term weight loss for obese folks is the exception, not the norm. Receiving the message that obesity is a disease and fixed may be affirming to an obese person who was previously told that weight loss attempts were a personal failing. Regardless, it could be argued that the positive impact of affirmation and acceptance is diminished if it’s accompanied by regular unhealthy food choices. In contrast, obese participants who were shown the control message of standard weight management strategies demonstrated a different pattern. Their concern for their weight did not decrease, but nor did they subsequently choose higher-calorie, unhealthy foods. The implication, which the researchers mention, is that some level of mild body dissatisfaction may be motivating to eat healthier foods and to be more active. But these findings present something of a double-edged sword, as Dr. Burnette mentioned at her recent talk. The weight management (control) message may have induced an incremental mindset of weight, the alternative to an entity mindset about weight. An incremental mindset affords people more agency by implying that weight can be altered, presumably through behavior change. Accompanying empowerment, however, is the shift in blame away from an obese person’s genes and onto them and their behavior. As Burnette said, promoting either mindset to obese and non-obese individuals alike can have negative effects. Anyone out there come across research that might answer this or have a suggestion? Post it in the comments! 1Hoyt, C.L., Burnette, J.L., & Auster-Gussman, L. (2014). “Obesity is a disease”: Examining the self-regulatory impact of this public-health message. Psychological Science, 25, 997-1002. 2 Dweck, C.S., Chiu, C.Y., & Hong, Y.Y. (1995). Implicit theories and their role in judgments and reactions: A world from two perspectives. Psychological Inquiry, 6, 267-285. 3 Burnette, J.L., O’Boyle, E., VanEpps, E.M., Pollack, J.M., & Finkel, E.J. (2013). Mindsets matter: A meta-analytic review of implicit theories and self-regulation. Psychological Bulletin, 139, 655-701. 4Monterosso, J., Royzman, E.B., & Schwartz, B. (2005). Explaining away responsibility: Effects of scientific explanation on perceived culpability. Ethics & Behavior, 15, 139-158. The largest Ebola outbreak in history is happening right now in Africa, with the first confirmed case diagnosed in the US just this past week. Admittedly, reports of Thomas Eric Duncan’s health are not good, with his status being upgraded to critical yesterday. But we also know that he is not getting the experimental drug that the patients brought back from Africa all received (Kent Brantly, Nancy Writebol, Richard Sacra, and an unidentified doctor). ** And we know that his family and those closest to him are being monitored by the Center for Disease Control, as well as over 100 people suspected of coming into contact with Duncan. This infographic making its own viral path through the interwebs pretty much sums up what we know about getting this disease: Ebola is not an airborne virus, and must be contracted by coming into contact with an infected person’s bodily fluids. This article provides a great overview of how an Ebola infection can occur (spoiler alert: the big 3 risk factors are caring for a patient at home, treating a sick person without using protective wear or preparing victims for funerals). Overall, the death toll of the current outbreak hovers around 50%. So what does this tell us about the spread of and vulnerability to this virus? Essentially that it is HIGHLY unlikely that you will contract Ebola here in the US, and you probably should not be traveling to West Africa any time soon. In addition, my mom would tell you to wash your hands and carry hand-sanitizer (she’s right). But psychologically, it’s a bit more complex. Over 100 Americans died of the flu during the 2013-2014 flu season, over 580,000 people died of cancer in 2013 and over 52,000 people died of pneumonia in 2011. So far, there has been 1 diagnosis of Ebola in the US, and 0 deaths, yet many people are absolutely terrified that they will catch Ebola at an airport or other public space. Overestimating the likelihood of the occurrence of an event based on the amount of available examples is something called the availability heuristic (1,2). One reason that we are more concerned about dying from Ebola than dying from the flu is because we can think of a lot of available examples of people who have died from Ebola, and we can think of no or very few examples of people dying from the Flu. Yet, we know it is far more common in the US. 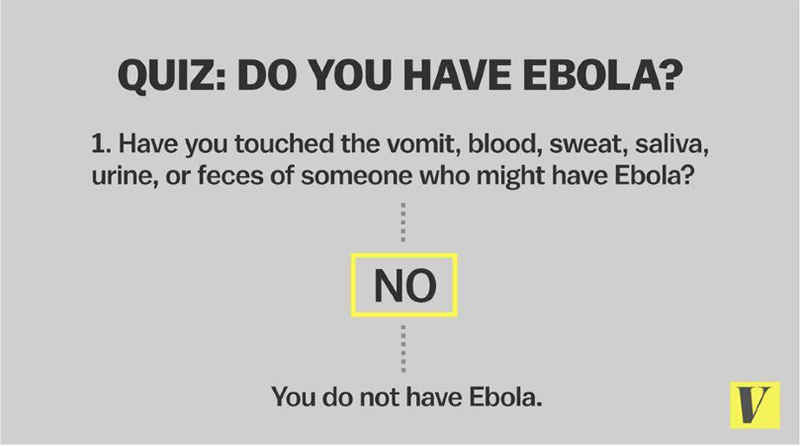 Now that we know how unlikely it is that we will get Ebola (phew! ), and we know why people are reacting so viscerally to the management of Ebola in the US, let’s turn to a potentially huge problem of this outbreak: Disease threat and it’s associated behaviors. Disease threat is managed interpersonally by something evolutionary psych researchers call the Behavioral Immune System (BIS). The BIS works by subconsciously preventing you from exposing yourself to disease threats, stopping illness before it happens (3). One of the ways this happens is through the disgust response (4). Bodily fluids tend to be fairly gross, causing a visceral reaction and encouraging people to get as far away from them as possible. This response is generally a good thing in terms of limiting sources of contagion, but it can also work through ethnocentrism (5). There is evidence that when people are feeling threatened by disease, they are more likely to show preference for their own groups, they are more likely to exhibit conformity and they exclude outgroups (6). Unfortunately, this effect also tends to isolate people with physical disabilities or disfigurements, who are somehow seen as possible contagion sources even though the vast majority of disabilities are not the result of contagious disease (7, 8). The risk of being exposed to increased prejudice and brusqueness from our fellow Americans is a far greater threat to all of us than the Ebola virus. In addition to it being incredibly unlikely that there will be an outbreak in the US, the probability that a person you are interacting with has come into contact with Ebola is practically nonexistent. So be vigilant with your hand-sanitizer, not with the strangers you meet. * Thanks to Dr. Mark Leary for the idea for this article! Check out his work about self-presentation and self-compassion here. **October 6th news reports that Duncan has received an experimental drug, though not the same as Brantly and Writebol. Sacra apparently got a different drug as well. Schaller, M., & Park, J.H. (2011). The behavioral immune system (and why it matters). Current Directions in Psychological Science, 20(2), 99-103. Oaten, M., Stevenson, R.J., & Case, T.I. (2009). Disgust as a disease-avoidance mechanism. Psychological Bulletin, 135(2), 303-321. Navarrete, C.D., & Fessler, D.M.T. (2006). Disease avoidance and ethnocentrism: The effects of disease vulnerability and disgust sensitivity on intergroup attitudes. Evolution and Human Behavior, 27, 270-282. Murray, D.R., & Schaller, M. (2012). Threat(s) and conformity deconstructed: Perceived threat of infectious disease and its implications for conformist attitudes and behavior. European Journal of social Psychology, 42, 180-188. Ackerman, J.M., Becker, D.V., Mortensen, C.R., Sasaki, T., Neuberg, S.L., & Kenrick, D.T. (2009). A pox on the mind: Disjunction of attention and memory in the processing of physical disfigurement. Journal of Experimental Social Psychology, 45(3), 478-485. Park, J.H., Faulkner, J., & Schaller, M. (2003). Evolved disease-avoidance processes and contemporary anti-social behavior: Prejudicial attitudes and avoidance of people with physical disabilities. Journal of Nonverbal Behavior, 27, 65–87.